Fast-food workers have made good on a promise of civil disobedience in protests aimed at boosting pay to $15 an hour and allowing them to join a union without retaliation. Organizers said Friday that fast-food workers at McDonald's (MCD), Burger King (BKW), Wendy's (WEN) and KFC, which is owned by Yum! Brands (YUM), walked off the job in 150 cities. They said nearly 500 people were arrested, although that number could not be immediately corroborated. 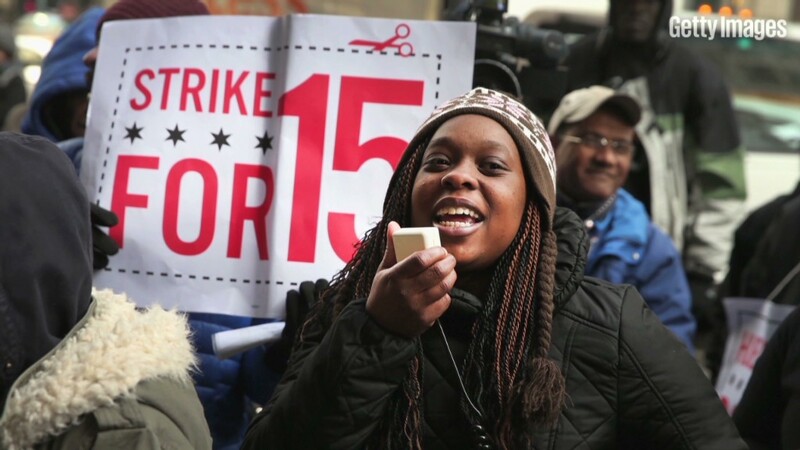 A statement from #StrikeFastFood said 50 fast-food workers were arrested in Chicago. However, a spokesperson for the Chicago Police Department said only 19 people were detained and ticketed for standing in the roadway near a McDonald's. The New York Police Department said Friday that a total of 34 people were arrested for disorderly conduct in connection with the protests. Demonstrators obstructed traffic outside of a McDonald's (MCD) in Times Square Thursday morning and picketed outside another location a few blocks away. In Detroit, police said 30 people were detained outside a McDonald's, with 24 of them being ticketed for disorderly conduct and six people arrested for outstanding traffic warrants. Police in Kansas City said on Twitter that 47 people were arrested for blocking a roadway. "Everyone was very cooperative," the tweet said. In Milwaukee, police said 27 people were arrested and cited for disorderly conduct related to disrupting traffic outside a McDonald's. One of those arrested was Rep. Gwen Moore, a Wisconsin Democrat, who received a $691 ticket for disorderly conduct. Her office in Washington said she will pay out of her own pocket. McDonald's said Thursday's events were "staged demonstrations" in which people were transported to fast-food locations with the help of union organizers. "We've had no reports thus far of service disruptions," the company said in a news release. The actions are the latest in a two-year effort by fast-food workers to get employers to pay a minimum wage of $15 an hour and allow them to form unions. The average pay for a food prep and service worker is $8.74 an hour, or about $18,000 a year. That's roughly $5,000 lower than the Census Bureau's poverty threshold level of $23,000 for a family of four. In New York, protesters were arrested today for obstructing traffic on 8th Avenue as they demonstrated for a $15 minimum wage. Thursday's protests come more than a month after the National Labor Relations Board's general counsel ruled that McDonald's is a joint employer that exerts substantial power over working conditions at its franchisees. The ruling, if upheld, means McDonald's could be held liable for labor violations at its more than 12,000 franchisee-owned restaurants. Related: "My boss doesn't rule my destiny"
The company said the preliminary NLRB decision is wrong and that it will contest the allegation. McDonald's has contended that franchisees operate as independent businesses and that, therefore, it's not liable. In March, McDonald's workers filed class-action lawsuits in New York, California and Michigan over wage theft violations. The suits allege that McDonald's has forced employees to work off the clock, not paid them overtime and struck hours off their time cards. In a statement to CNNMoney, McDonald's said that it does not determine wages set by its franchises. Union organizers said that protests like the ones held in U.S. cities Thursday, have elevated the debate about inequality in the United States. 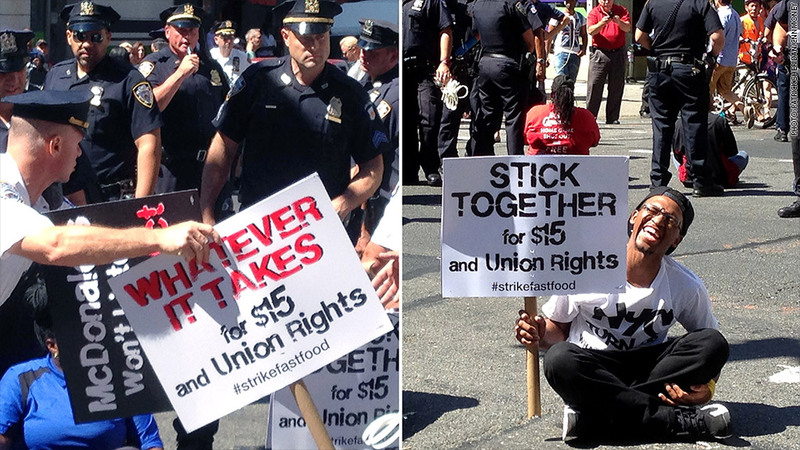 They said the protest movement has helped raise the minimum wage in some states, including Connecticut and New Jersey.